On top of the water, underwater and on the seabed, vehicle robotics are quickly proving their value as a game changer. Profiled here are some latest developments. Pharos Offshore acquired an SMD built 1200HP cable burial tool in July 2013, since then the vehicle has undergone extensive modifications at the Tees Offshore Base, in Middlesbrough that have enhanced the configuration to provide a more effective post lay/installation burial vehicle. The UTV1200 has a combination of jetting tool packages to meet client requirements where the jetting assembly has been relocated within the core vehicle frame, where the centrally mounted jetting swords optimize steering and handling as well as cable acquisition capability, thus allowing 10m radial maneuverability during jet trenching operations. With a rated production speeds greater than 300m/h at 1.6m trench depth for jetting of sands greater than 50KPa. Modifications also include the removal of the cable reel system which has reduced the center of gravity by reducing the height of the lift frame greatly improving the vehicle stability. Engineering and design has been completed on a complimentary mechanical chain cutting package in coordination with spoil eduction from the cutting face and the base of the trench formation immediately astern of the cutting tool. Product handling is accomplished by means of two elliptical manipulators to place the product in the cable highway, which also incorporates an automatic cable discharge system. Modular by design, integration is by means of two flange faces; reconfiguration between jetting and mechanical trenching may be performed on location within 36 hours. “The previous configuration of UTV1200 (LBT1) allowed for concurrent trenching (mechanical and jetting) of a pre-loaded product, however after carrying out research the integration of a pre-loaded product was deemed too specialized in the current market, driving the equipment modifications,” said Chris Gamble, Director of Operations. UTV1200 can be provided on project specific terms or through a long term lease, in coordination with our expertise, we can offer operational teams to undertake all trenching project requirements. Bibby Remote Intervention Limited (BRIL) has secured a multimillion contract with Olympic Shipping to install two 150 horsepower deep water Quasar ROVs onboard the construction support vessel (CSV), Olympic Ares. The two ROVs will be installed in the purpose built ROV hangers onboard the vessel by BRIL for ROV and survey services. This follows the signing of a charter agreement with Bibby Offshore and Olympic Shipping for the Olympic Ares for a seasonal charter during 2014 with options to extend. BRIL will install the ROVs in Q4 this year and Bibby Offshore and Olympic will jointly market the vessel up until the charter agreement begins in 2014. Increased market demand for ROV services, along with contract wins in the renewable and oil and gas sector has driven BRIL’s rapid development. 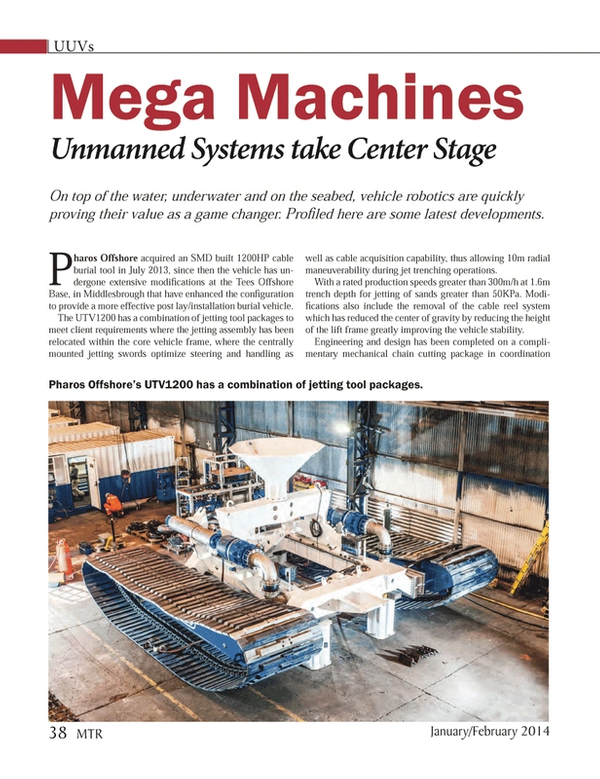 “To deliver high quality products and services to our clients, we have invested significantly in our ROV fleet, including the addition of the 150hp Quasars to our13 systems,” said Mike Arnold, chief operating officer, BRIL. Bibby Offshore with new sister company Bibby Remote Intervention Limited (BRIL), has grown from 10 employees in 2003 to now employing more than 1,300 people onshore and offshore worldwide, with offices in Aberdeen, Liverpool, Singapore, Trinidad and Houston. The company has an international fleet of six subsea support vessels and 13 Remote Operating Vehicles (ROV) and will continue to add to its fleet to meet demand. C-Enduro recently underwent trials, organized by the National Oceanography Center (NOC), trials attended by the potential users from NOC and Royal Navy personnel who saw the C-Enduro operate autonomously and follow various courses set out by ASV’s control system. The highlight of the two day event came when the vehicle followed a course spelling out ‘ASV’. C-Enduro is designed to deliver a step change in oceanographic data collection, with an endurance of up to three months enabled by its power structure which can support up to 500 watts of payload power. The applications for the vehicle range from marine environmental surveying to security and defense roles. C-Enduro was developed under a UK Government-backed Small Business Research Initiative (SBRI) initiated by the National Oceanographic Centre’s (NOC) requirement for long endurance USVs for environmental research. The initiative is co-funded by the National Environment Research Council (NERC), NOC’s parent body, with the Technology Strategy Board (TSB) and the Defense, Science and Technology Laboratories (DSTL). The team behind the development of the LEMUSV, led by ASV, includes Hyperdrive Ltd who investigated motor options and power management systems and Cranfield University who have conducted research into collision avoidance technologies. ASV undertook the detailed production design, build and commissioning of the fully operational, open ocean going C-Enduro vessel. The robust vehicle design utilises state of the art technologies from the consortium and was designed to operate in coastal or open ocean weather conditions, currents and sea states. SeaRobotics has deployed a “collapsible” unmanned surface vehicle (USV) in support of important Arctic fisheries research conducted by Florida International University (FIU). The collapsible, 4m USV was used to provide a broad range of survey data regarding the seabed off the shores of Point Barrow, Alaska, the northernmost point in the U.S.
At the request of FIU, SeaRobotics outfitted the USV with an array of sensors that included a Kongsberg EK-60 split-beam echo sounder, M3 multi-beam sonar, 1.8 MHz DIDSON imaging sonar, and a low-cost side-scan sonar system. This equipment enabled researchers from FIU to perform a bathymetric survey of the seabed and collect other data regarding the health of fisheries located in the coastal waters of the Chukchi and Beaufort Seas. “We generated some very exciting data using the USV while keeping our research personnel safely on shore. Safety and efficiency are always major concerns when working in the Arctic and having a programmable, stable, and robust platform allowed us to collect novel data in challenging conditions,” said Kevin Boswell , Marine Sciences Professor in the Biology Department at FIU. “We also benefitted from the considerable amount of support given to us by residents of the Alaskan native community in the Barrow area. Their assistance will continue to be important to our future research efforts in the area including our return trips to the Arctic with the USV,” added Boswell. Applications for SeaRobotics include bathymetric and hydrographic surveys; coastal, harbor, and riverine surveillance; and target and destructive test boats. SeaRobotics surface vehicles range from small, modular, man-portable systems to large, long-endurance workhorse vehicles that provide survey and surveillance systems. With 11 thrusters, high payload, and a host of advanced technology, the new Saab Seaeye Leopard ROV recently made its debut. Aimed at the compact work-class market, Leopard was designed to be best-in-class regarding the handling of tooling, cameras and survey equipment. As always, Saab Seaeye is mindful of preserving precious deck space, and the the minimal deck footprint of the Seaeye range is maintained with the combination of a 20 x 8 ft. single lift, A-Frame & winch LARS and a 20 ft. control cabin for easy transport and rapid mobilization. Its pack of eight horizontal thrusters and three vertical thrusters is designed to give Leopard exceptional thrust, powering the vehicle forward at over four knots, and enabling it to hold steady in strong cross-currents. For the pilot, the vehicle’s iCON intelligent control system gives clear and enhanced information while independently managing each device on the vehicle, including auto redundancy that will keep the ROV working even with multiple equipment damage. The pilot will also find that iCON includes pitch and roll stabilization for stable flight even with large tools and sensors deployed. In addition, the networked design of the iCON control system has refined the main electronics pod into an intelligent power distribution and data hub, and relocated the brains of the system into sensors and actuators around the vehicle. The chassis was designed with rapid reconfiguration and easy maintenance in mind. A large open payload bay within the vehicle allows for ample tooling and survey sensors to be installed rapidly on sliding trays. Its one-ton through-frame-lift capability and four point docking system for tooling skids allows more demanding payloads to be added. First to order the Leopard is Australian-based Dive Works Subsea Solutions. “We’ve found that even though we are a Commercial Diving and ROV services company, the industry is heading more and more towards using ROV’s rather than divers,” said Andrew Ford, Managing Director, Dive Works Subsea Solutions. “Over the past few years, more than half of our work has been for Falcon ROV services.” Dive Works are focused on servicing the Australian Oil and Gas industry. Oceaneering subsidiary Deep Sea Systems (DSSI) has designed and built the Sea Maxx Satellite Remotely Operated Vehicle (SAT-ROV) to work in tandem with work class ROVs at depths up to 4,400m. This SAT-ROV is deployed from a separate housing mounted beneath the work class ROV cage. The SAT-ROV is 18 x 24 x 30 in. and 230 lbs. in air and it is positively buoyant in water. Sea Maxx is powered by four thrusters including two horizontal, one lateral and one vertical. It is equipped with a wide angle HDTV camera module, two variable intensity 40 watt LED lights and a 450 ft. length tether. The small size of the Sea Maxx allows it to inspect difficult to reach and confined areas that a larger Work Class ROV cannot access. Sea Maxx ROV is controlled via a fiber optic link through the WCROV armored umbilical cable. The control CPU, display and joystick controls are mounted alongside the WCROV console allowing for tandem or independent operations. The Sea Maxx is equipped with an advanced undersea HD camera optimized for wide angle close-up inspection and the ability to zoom-in to obtain additional detail. Images are recorded without loss of quality by a high resolution digital video recorder. Upon completion of ROV operations, HD video / stills can be provided to the customer. The HD camera allows operators to obtain 2.0 mega-pixel digital images anytime during operations with or without ROV sensor data overlay. Teledyne Gavia said that it sold two additional 1,000m depth rated Gavia Offshore Surveyor Autonomous Underwater Vehicles (AUVs) to UTEC Survey Inc. of Houston. UTEC purchased its first Gavia AUV in August 2011 then took delivery of a second vehicle in April 2012. After honing their AUV operations over the past two survey seasons, the company decided to increase the fleet with the purchase of two further vehicles, the first delivered in October 2013 and the second system delivery due early in 2014. The UTEC Gavia AUVs are fully equipped for geophysical surveys in near-shore environments out to 1,000m. UTEC’s Gavia AUVs have recently proven their capability off East Africa where they are used for a wide variety of offshore survey and inspection tasks. The vehicles are fitted with swath bathymetry, side scan sonar, sub bottom profiler modules, as well as a depth rated camera with strobe lighting. The built-in camera allows for overlapping images which are digitally stitched together forming a complete mosaic of the survey mission. The two most recent vehicle purchases come with the DVL aided ROVINS154 Inertial Navigation System module (IXBlue, France), providing a high accuracy INS in a package that is not of US origin so it does not automatically come under the ITAR export control regulations. All UTEC AUV INS navigation is further enhanced by the additional purchase of both USBL and LBL systems from Teledyne Benthos (Falmouth, Mass.) which provide aiding to the INS enabling higher accuracy and longer endurance missions. SRI International demonstrated capabilities for conducting underwater chemical surveys with its in situ membrane introduction mass spectrometry (MIMS) device integrated into a Bluefin-12 autonomous underwater vehicle (AUV). The sensitivity, specificity, and versatility of mass spectrometry enable in-water identification and analysis of a wide range of chemicals. The unique capabilities of the SRI MIMS device integrated into the Bluefin-12 AUV platform addresses complex survey and data collection challenges associated with ocean monitoring and exploration, including an enhanced ability to differentiate hydrocarbon sources (e.g., biogenic versus thermogenic) and high-fidelity baseline measurements to understand with greater accuracy the impact of drilling in specific areas. Shark Marine Technologies delivered the newly enhanced Sea-Wolf 3 ROV system to The State Oceanic Administration of China, which will use the Sea-Wolf 3 to perform marine scientific surveys and research activities. The SOA is responsible for overseeing marine construction projects, submarine engineering projects and routine coastal surveillance. The Sea-Wolf 3 system is loaded with extras and software capabilities just recently introduced into the light work/ inspection class of ROVs. The system was designed for increased modularity and ease of maintenance and configurations. The Sea-Wolf 3 has an increased payload, an external pan/tilt platform and an open frame design to allow more flow to the thrusters and less drag in currents. This system features the DiveLog software, adding a new level of autonomy for the ROV pilot. New capabilities include: Route Following, Go To, and Station Keeping. DiveLog has also simplified the data inputs from multiple sensors onto one screen, whilst recording all the data into convenient project folders. Marine Technology Reporter is the world's largest audited subsea industry publication serving the offshore energy, subsea defense and scientific communities.